What: This project will be a field-based study of the structural, tectonic, metamorphic and thermal history of the spectacular northern Snake Range in eastern Nevada. The Snake Range is a classic example of a metamorphic core complex where mid-crustal metamorphic rocks have been penetratively deformed and exhumed by tectonic extension along a major low-angle normal fault and shear zone. Fieldwork portion (~2.5 weeks): The northern Snake Range (Mount Moriah Wilderness Area) in eastern Nevada. Ely, Nevada is the closest town (about 1.5 hours away). Sample preparation and analytical work (~1.5 weeks): UC Santa Barbara. Students will fly into Las Vegas, NV and fly out of Santa Barbara or Los Angeles, CA. 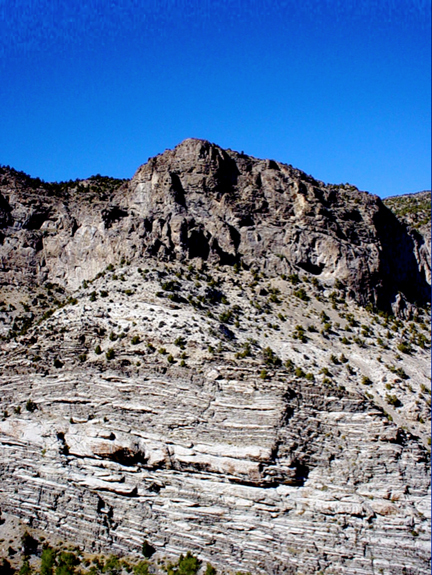 The 2012 Snake Range project will investigate the tectonic evolution of the northern Snake Range metamorphic core complex in eastern Nevada. The Snake Range is one of the archetypical examples of a metamorphic core complex, where large-scale crustal extension associated with slip on a presently low-angle “detachment” fault (the northern Snake Range Decollement) has juxtaposed mid-crustal, highly strained and metamorphosed rocks in the footwall and imbricately normal faulted supracrustal rocks in the hanging wall. The Snake Range has played a central role in our understanding of extensional tectonics, and yet many fundamental questions about the tectonic and structural development of this feature remain controversial. This goal of this project is to provide new constraints on the structural and tectonic development of this core complex by combining structural field mapping, strain analyses, and microstructural studies together with thermobarometric studies and U-Pb geochronology and 40Ar/39Ar thermochronology. Our study will focus mainly on the lower plate of the core complex and examine in detail the spatial variations in the magnitude, timing, and kinematics of penetrative strain, metamorphism, and exhumation in the metasedimentary and plutonic rocks of the football. The project will spend approximately 2.5 weeks in the Snake Range, followed by 1.5 weeks at the University of California, Santa Barbara for sample preparation and geochronologic analyses. Structural studies of the footwall mylonitic fabrics (3-4 students): Despite a number of previous studies, the timing, kinematics, and tectonic significance of the mylonitic fabrics in the footwall rock of the Snake Range remains enigmatic. Do these rocks record a single or multiple phases of penetrative strain? What is the relationship between the footwall mylonites and the overlying detachment fault? What were the P-T conditions of deformation? What was the partitioning between coaxial and non-coaxial deformation? Deformed rocks in the shear zone provides outstanding opportunities for a variety of structural studies on a variety of scales from map scale to the outcrop to hand sample to microscopic. All structural projects will involve a component of detailed geologic mapping and field measurements complemented by appropriate laboratory/analytical work. Specific projects could include finite strain studies using various strain markers (Formation and bedding thicknesses, stretched pebble conglomerates), petrographic observations of micro-structures and kinematic indicators, and electron backscatter diffraction (EBSD) analyses of crystallographic preferred orientations (CPO) in mylonitic quartzite and granite. These studies will provide new information on the footwall strain history and temperature conditions during deformation. Footwall metamorphism and thermobarometry (1-2 students): Footwall schist units contain peak Cretaceous metamorphic assemblages of garnet + biotite + muscovite ± plagioclase ± staurolite ± kyanite. These units offer an excellent opportunity for traditional metamorphic petrology using petrographic and SEM observations. In addition, these and other assemblages are suitable for several thermobarometers such as GARB thermometry and GMBP and GASP barometers using an electron microprobe, depending on the proximity of the home institution to a microprobe and on-campus faculty expertise. U-Pb zircon and sphene geochronology (1-2 students): A number of important footwall granite units that bear on the magmatic, metamorphic and strain history of the footwall remain undated. In addition, the precise timing and spatial variations in peak metamorphism remain only loosely constrained. Possible student projects would be to date a variety of footwall granites, dikes and sills that intrude the footwall. Another possible project is to conduct U-Pb geochronology on igneous and metamorphic sphene from footwall samples. The U-Pb sphene system is increasingly being employed as a thermochronometer sensitive to cooling through ~550°C, depending on grain size. Thus, U-Pb sphene dating can provide new insight into the high-temperature cooling history of the footwall shear zone. All U-Pb geochronology will be conducted at UC Santa Barbara Laser ablation ICPMS laboratory during the on-campus portion of the project. 40Ar/39Ar thermochronology (1 student): The thermal history of the footwall can provide insights into the timing of metamorphism as well as the timing and geometry of tectonic exhumation during extensional events. A fairly large thermochronological data base (argon, fission track) already exisits for the Snake Range, but we will conduct much more detailed and targeted thermochronological transects aimed at understanding spatial variations in the burial and exhumation history. One student project may involve 40Ar/39Ar thermochronologic analyses of footwall muscovite, biotite and K-feldspar to further constrain the footwall thermal history. K-feldspar analyses will include multiple-diffusion domain (MDD) modeling of the 40Ar/39Ar results to assess a continuous cooling history from ~300-150°C. We anticipate that most of the mineral separation for 40Ar/39Ar analyses will be done during the on-campus portion of the project and all 40Ar/39Ar analyses will be done at UC Santa Barbara. Highly strained quartzite with a pronounced foliation and lineation. Students should have taken courses in structural geology, a basic mineralogy and/or petrology course. Any field experience or field camp is a plus but not required.